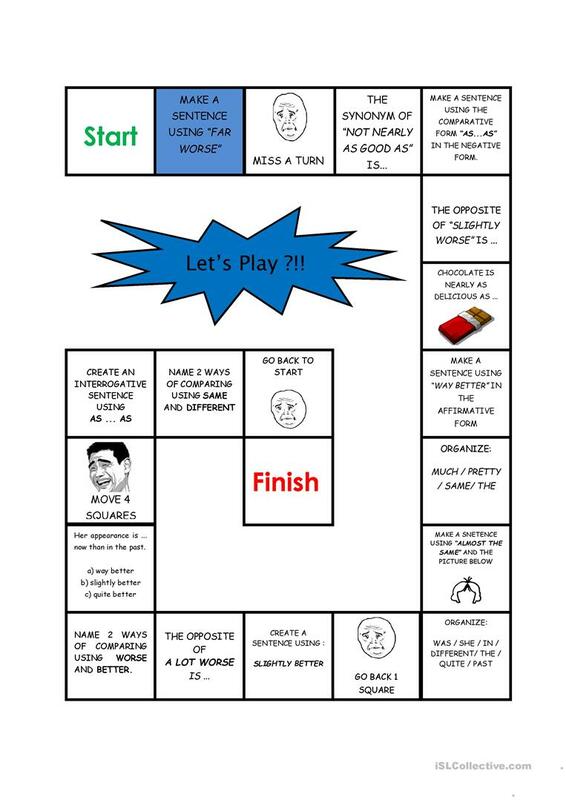 it's a board game to practice ways of comparing. You can use counters and a dice. You should divide the class in groups or pairs. Have fun with your students !!!! This downloadable worksheet is a great resource for high school students and adults at Intermediate (B1) level. It is great for consolidating Comparisons: AS or THAN in English, and was designed for improving your students' Speaking skills. nineka is from/lives in Brazil and has been a member of iSLCollective since 2011-03-16 19:50:10. nineka last logged in on 2019-04-12 11:28:13, and has shared 2 resources on iSLCollective so far.